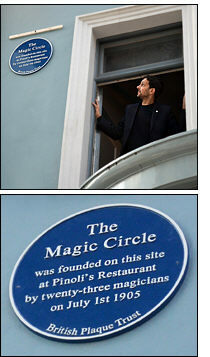 This is where it all began... "The Magic Circle was founded on this site at Pinoli's Restaurant by twenty-three magicians on July 1st 1905"
On Wednesday, 13th April, magicians and members of the public gathered outside 17 Wardour Street in the heart of London for the unveiling of a commemorative Blue Plaque. An official Blue Plaque promotes the history of a building and some of its notable inhabitants, in this case twenty-three magicians and their founding of The Magic Circle on 1st July 1905. It is a recognised symbol of national English heritage, run by the Royal Society of Arts, the London County Council, the Greater London Council and, since 1986, English Heritage.